Even spacious cabinet made of glass (in this case —usually featuring glass doors or decorative inserts) looks more compact than its solid wood or MDF counterpart. Glass, with its cheerful light look, has what it takes to brighten up any room — even a small hallway. Another feature you might find appealing is that glass is definitely one of the most interior neutral materials. Glass shoe storage cabinet can fit into modern, traditional, and of course — mixed style interiors, regardless of the main focus. Moreover, some vintage designs can also feature glass doors or simply some glass elements. You might have already guessed that there are dozens of options available — and all of them differ in styles and designs. Also, do not forget that it is possible to find models with clear or tinted glass. No doubt, clear glass is less interior demanding. Tinted one, though, can help to brighten up your interior palette. When it comes to functionality and dimensions, there will be even more models to consider. 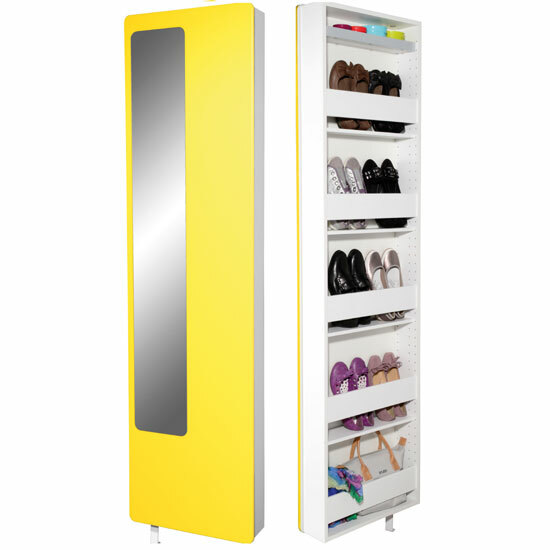 Some of the glass shoe storage cabinets available in stores will be very compact; others will feature spacious designs and several internal storage units. In any case, it will not be difficult to a piece that would fit perfectly into your hallway — both in terms of style and actual physical dimensions. Glass is hardly ever the only production material — especially when it comes to storage units. The good news is that it looks fabulous with any other material types — genuine wood, glossy MDF, stainless steel, as well as with different combinations of the above. Finally, glass is one of those materials that will unlikely vanish from out homes. Furniture with glass inserts has been produced for centuries now, and there is absolutely no reasons for that to change. If you would like to find a quality glass shoe storage cabinet as quickly as possible, take a look at Furniture in Fashion website. This is one of the best e-commerce stores in the United Kingdom, offering a gorgeous selection of finest quality furniture from trusted local and international manufacturers. In addition, this local store offers you a chance to visit company showroom in Farnworth, thus combining the convenience of shopping online with an opportunity to check any items you like in a real life mode. And, of course, like most local stores, it can ensure quick delivery to any part of the UK.